Poultry by-product meal is one of the most important source of animal protein used to feed domestic animals, along with meat and bone meal, blood meal, feather meal and fish meal (Meeker et al., 2006). It is made by combining the by-products coming from poultry slaughterhouses or poultry processing plants. The AAFCO (USA) defines poultry by-product meal as the ground, rendered, clean parts of the carcass of slaughtered poultry such as necks, heads, feet, undeveloped eggs, gizzards and intestines (provided their content is removed), exclusive of feathers (except in such amounts as might occur unavoidably in good processing practices) (AAFCO cited by Watson, 2006). Whole poultry carcass meal can also be obtained from culled laying hens (spent hen meal), notably in areas where there is no market for culled hens (Kersey et al., 1997; Hertrampf et al., 2000). The nutrient content of poultry by-product meal can be quite variable and depends on the substrate that is being processed (Watson, 2006; Dale et al., 1993). It is generally a palatable and high-quality feed ingredient due to its content in essential amino acids, fatty acids, vitamins and minerals. In addition to its use in livestock, it is in high demand from the pet food and aquaculture industries (Meeker et al., 2006). Poultry by-product meal is golden to medium brown in colour with a fresh poultry odour (Hertrampf et al., 2000). Worldwide, more than 55.5 billion broilers were slaughtered in 2009 and yielded about 16.5% offals. Assuming an average weight at slaughter of 1.8 kg, it may be inferred that each broiler gives 0.3 kg offal (Hertrampf et al., 2000). The total production of broiler offal can then be estimated at about 17 million tons/year. This estimation does not take spent laying hens into account (FAO, 2011; Hertrampf et al., 2000). The use of poultry by-product meal for livestock feeding was banned in 2002 in the European Union (Regulation (EC) No 1774/2002) (European Community, 2002). 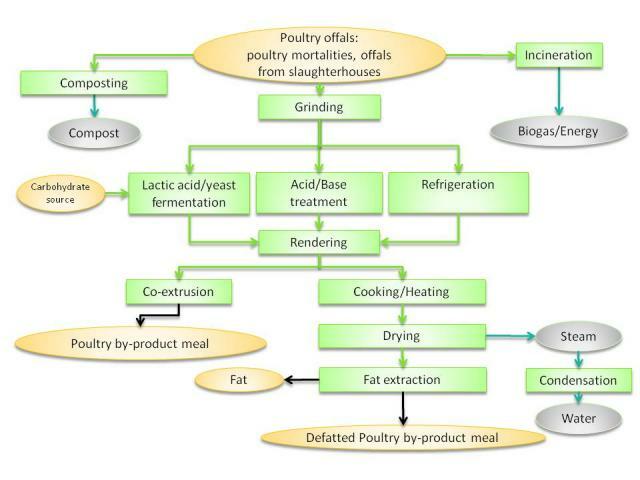 Processing poultry offals into poultry by-product meal requires several steps. Poultry offals are primarily collected in containers where they can be stabilized through fermentation with molasses or brewer's grain. This operation reduces pH and stops bacterial and viral development (Cai et al., 1994). Stabilization may also be achieved with acid or basic treatments. Mineral acids such as sulfuric or phosphoric acids are effective in preserving poultry wastes. Organic acids are also potential preservative treatments. Among chemical bases, NaOH treatment is also a potential preservative (Blake, 2000). The traditional way of processing offals used to be wet-rendering (cooking under steam pressure) but it was replaced by dry-rendering, which resulted in meals of higher quality (Allbright, 1931). The stabilized (or not) poultry offal is cooked/sterilized and dried down to 8% moisture. When the resulting meal appears to be too fat (above 16% fat), rancidity problems may occur during storage. Fat extraction is therefore recommended and yields a 10-12% fat content poultry by-product meal (El Boushy et al., 2000). The overall process is described in the figure above. High-fat whole poultry meal can also be obtained by alkaline hydroxide treatment of whole poultry carcasses followed by freeze-drying (lyophilisation). Freeze-drying is an interesting way of stabilizing poultry carcasses before transformation into meal in places where odours are not tolerated by the neighbourhood. The resulting meal was found to be free of pathogens. It has a higher fat content and a lower crude protein than poultry by-product meal (Shafer et al., 2001; Gillies, 1979). Whole poultry meal (spent hen meal) can also be obtained by classical rendering (Kersey et al., 1997). Processing poultry by-products into feed is a good way to mitigate the environmental problems caused by poultry processing. If not properly managed poultry offals released in the environment are vectors for insects, vermin, bacteria and viruses, which may result in water contamination (leaching of nutrients and pathogenic microorganisms) and air pollution (noxious gases and nuisance odorants) (FAO, 2011). Like other rendering by-products, poultry by-product meal is rich in protein, fat and minerals, and is a good source of essential amino acids for monogastric species. The composition of poultry by-products depends on processing conditions and on the source of raw materials (Johnson et al., 1997). Some poultry by-products have a very high protein content in the 75-90% range with relatively low contents of ash (less than 10%) and fat (less than 15%). Other poultry by-products are of lesser quality, with a protein content in the 55-75% range and higher amounts of ash (up to 15%) and fat (more than 15% and up to 30%) (Feedipedia, 2011). Poultry by-products result in pellets of poor quality (3 on an empirical scale of 10) (Thomas et al., 2001). Poultry offals obtained from healthy birds are classified as low-risk material. On the contrary, poultry offals originating from the death of ailing poultry may transmit diseases to humans, livestock or other poultry and should be characterized as high-risk material. These two types of poultry offals should not be mixed since both must subsequently be treated as high risk material, thus requiring energy-intensive rendering if they are intended for feed or fertilizers (Williams, 2010). It should be noted that poultry by-product meal is still prohibited in the European Union for livestock feeding (2011). High-fat poultry by-product meal (16% fat) is prone to rancidity, which may result in various symptoms including diarrhoea, low feed intake (anorexia), poor animal performance, myopathy, hepatomegaly, steatitis, haemolytic anemia and deficiencies in vitamins A and E in non-ruminants (El Boushy et al., 2000; Allen et al., 1994). Poultry offal meal is a suitable source of protein for ruminants (El-Sayed et al., 1997). Particularly, the heat treatment applied to poultry by-products during processing makes the final meal a valuable source of rumen undegraded proteins for ruminants. The effective crude protein degradability of poultry by-product meal is lower than that of soybean meal (Silva et al., 1999; Souza et al., 2000; Kamalak et al., 2005) and rapeseed meal (Mustafa et al., 2000), with a ratio of 0.7-0.8, and much lower than that of whole cottonseed (ratio of 0.6-0.7) (Ilghami et al., 2008). However, it is higher than that of meat and bone meal (Klemesrud et al., 1997), feather meal (Klemesrud et al., 1998), blood meal and corn gluten meal (Bonhert et al., 1998). Protein digestibility is also lower than that of soybean meal but higher than that of meat and bone meal (Klemesrud et al., 1997). Additional processes can modify protein degradability: it increased after enzymatic or NaOH treatment of spent hen meal (Kim et al., 2003), and decreased when sulfite liquor is applied to the carcasses of laying hens (Wilson et al., 1998). As a consequence of its low degradability, dietary use of poultry by-product meal increases the duodenal flow of amino acids (Bonhert et al., 1998; Bonhert et al., 1999). However, it may be necessary to add a source of soluble nitrogen in the diet to maintain microbial synthesis in the rumen (El-Sayed et al., 1997). Poultry by-product meal can be used as a protein supplement for dairy cows. Daily amounts of 0.5 to 0.7 kg have been recommended (Schroeder, 1999). Including up to 1 kg/day in a maize silage diet increased milk yield and improved milk composition (Gonzalez et al., 2007). However, lower inclusion rates may be necessary due to palatability issues. The use of poultry by-product meal in prepartum diets is also possible and allows normal reproductive performance and milk production. (Yazdi et al., 2009). It is also better to include poultry by-product meal in a total mixed ration rather than adding it to the diet (Schroeder, 1999). Poultry by-product meal fully replaced soybean meal (on a protein basis) in the diets of steers without negative effects on consumption or diet digestibility (Silva et al., 2002) and with similar (Bonhert et al., 1998) or higher (Klemesrud et al., 1998) results for daily gain and feed efficiency. Adding poultry by-product meal in the diets of finishing steers increased metabolizable protein supply better than urea supplementation. The difference in protein efficiency is due to the amount of metabolizable methionine. However, when using poultry by-product meal, tryptophan may be the first limiting amino acid for steers (Klemesrud et al., 1997). In Holstein calves, supplementation with poultry by-product meal at 10% resulted in higher growth performance and economic efficiency (Al-Saiady et al., 1997). Poultry by-product meal was found to be a useful and cheaper protein substitute for soybean meal in rations for growing lambs. It improved daily gain without altering feed conversion efficiency, and decreased feed cost when added to whole chopped sugarcane-based diets (Lallo et al., 1994). Including poultry by-product meal up to 10% in high-concentrate rations enhanced growth performances and feed efficiency (Al-Saiady et al., 1996; Alshaikh et al., 1997) and increased energy retention (Kraidees et al., 1996). Wastewater from poultry processing can be purified by the dissolved air floatation technique, and the resulting sludge can be further processed and dried, yielding a product called ‘secondary protein nutrients’ which contains about 47% protein (DM basis). This product can be included in diets of steers in order to supply up to 25% of supplemental nitrogen without a negative impact on performances. It can also be included at up to 40% of the supplemental N in meat goat rations (Freeman et al., 2008). The substitution of 60% of soybean meal protein by protein of a coextruded blend of the hard tissue fraction from spent hens with soybean hulls increased DM intake and nitrogen retention in growing goats (Freeman et al., 2009). Poultry by-product meal may be utilized similarly to meat meal in pig rations. It is generally palatable and can be fed to all classes of pigs without major problems. Its amount of digestible lysine (about 2.5% DM) is comparable to that of soybean meal (Rostagno et al., 2005). The amino acid composition is similar to that of meat meal or meat and bone meal, but of slightly lower quality than that of fish meal. The amino acid digestibility seems to be lower than for soybean meal, and quite variable according to the processing method (Knabe et al., 1989). The DE and ME values of poultry meal vary from 16.3 to 18.5 MJ/kg and from 14.9 to 17.2 MJ/kg, respectively (Rostagno et al., 2005). The NE value of poultry meal can be calculated from ME values using a NE/ME ratio of 70%. Little research has been done on the use of poultry by-product meal in pig feeding. In starter diets, 10% of poultry meal was used without a negative effect on growth performance (Veum et al., 1999; Keegan et al., 2004; Keegan et al., 2003). For young pigs with a lower growth potential (less than 350 g/d on average from 10 to 45 kg BW), poultry meal replaced 100% of the protein component of the diet (Kannan et al., 2008). In a diet formulated from weaning to slaughter, up to 7.5% poultry meal was used with no adverse effect on growth (Orozco-Hernandez et al., 2003). The inclusion of poultry meal as a sole protein source in growing-finishing diets decreased feed intake and growth when compared to a soybean meal-based diet (Shelton et al., 2001). Chicken offal meal replaced about 50% of soybean meal (14% of the diet as fed) for growing pigs without depressing performance or carcass characteristics (Van Lunen et al., 1991; Van Lunen et al., 1990). Chicken offal meal also replaced 33% of fish meal in pig diets without depressing performance or carcass characteristics (Fanimo et al., 1997). In order to further reduce cost by decreasing the consumption of energy necessary during the rendering process, researchers have ensiled poultry by-products with promising results. Poultry offal ensiled with maize (30:60) and Lactobacillus acidophilus can be included at up to 20% in growing-finishing diets with no deleterious effect on average daily gain (Tibbetts et al., 1988; Hong et al., 2001). When introduced at up to 4% in balanced broiler diets, performance was unchanged (Kirkpinar et al., 2004). In previous experiments, the same results were observed when including poultry by-products up to 10% in broiler diets (Mendonca et al., 1989; Escalona et al., 1987). In laying hen diets, poultry by-products have no detrimental effects on performance and egg quality up to an incorporation level of between 5% (Senkoylu et al., 2005) and 7.5% (Hosseinzadeh et al., 2010). Poultry by-products can be extruded with cereal grains, yielding an ingredient with a higher protein value than that of meat and bone meal (Aimiuwu et al., 2006). Poultry by-product meal was included at up to 8% and completely replaced fish meal in the diets of broiler rabbits and angora rabbits (Ahlawat et al., 2001; Ahlawat et al., 2003). With an adequate diet formulation, taking in account the protein, fat and amino-acids content, up to 10% poultry by-product meal was included without impairing growth performance (Sanz et al., 1992). At an inclusion level of 18%, chicken offals reduced growth compared to fish meal (27 vs. 30 g/d) but the economic result (cost/kg meat produced) was improved by 10% (Fotso et al., 2000). As noted above, poultry by-product meal has a detrimental effect on pellet quality (Thomas et al., 2001). Recommended inclusion levels of poultry by-product meal for fish are in the 5-25% range with a mean use of 5-10%. Poultry by-product meal has one of the best overall amino acid profile of all the main by-products of the processing of land animals (Tacon et al., 2009). Poultry by-product meal was found to be an adequate supplemental protein source for carp (Trzebiatowski et al., 1982). Best growth occurred when poultry offal meal provided 75% of the supplemental protein when combined with fish meal (Hasan, 1991). Fish meal could be fully replaced by poultry offal meal without adverse effect on carp growth (Hasan et al., 1993). In rainbow trout (Oncorhynchus mykiss), protein digestibility of poultry by-product meal seems to have increased steadily since the late 1970s: while the first reported value was rather low (about 70%), later researchers have observed digestibility values up to 87-91% (Bureau et al., 1999; Dong et al., 1993; Hajen et al., 1993; Sugiura et al., 1999). A high protein digestibility (80%) for poultry by-product meal has been observed in gilt-head sea bream (Sparus aurata) (Lupatsch et al., 1997). Recommended inclusion levels of poultry by-product meal for crustaceans are in the 3-20% range with a mean use of 4-8% (Tacon et al., 2009).